Back row, from left to right: Dr. Roland Hernandez, Superintendent of Schools; Tony Elizondo, CCISD Board President; Marty Bell, CCISD At-Large Board Member; Dr. Tony Diaz, CCISD Assistant Secretary. Front row, from left to right: John Longoria, CCISC District 1 Member; Janie D. Bell, CCISD Trustee; Harold Shockley, Jr., IBC Bank-Corpus Christi President & CEO; Catherine Susser, CCISD Vice President. 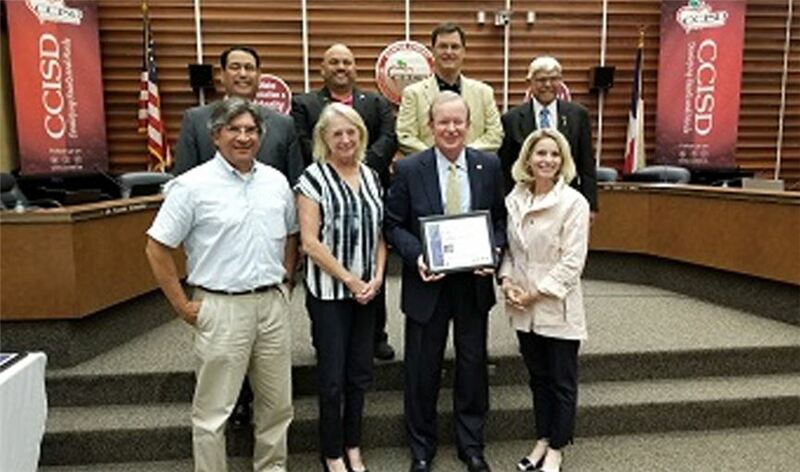 The Texas Association of School Boards recognized IBC Bank-Corpus Christi for its dedication to community schools and financial literacy education as part of the Stand Up for Texas Public Schools Advocacy Campaign. The Corpus Christi ISD Board of Trustees presented IBC Bank with the award on June 18 at a board meeting. Stand Up for Texas Public Schools is a campaign to encourage active advocacy on behalf of the public schools in communities and throughout the state.